Dubai: History was made at Meydan Racecourse yesterday when Thunder Snow became the first horse to win the $12 million Dubai World Cup (Group 1) twice - having stormed to an imposing victory twelve months ago. 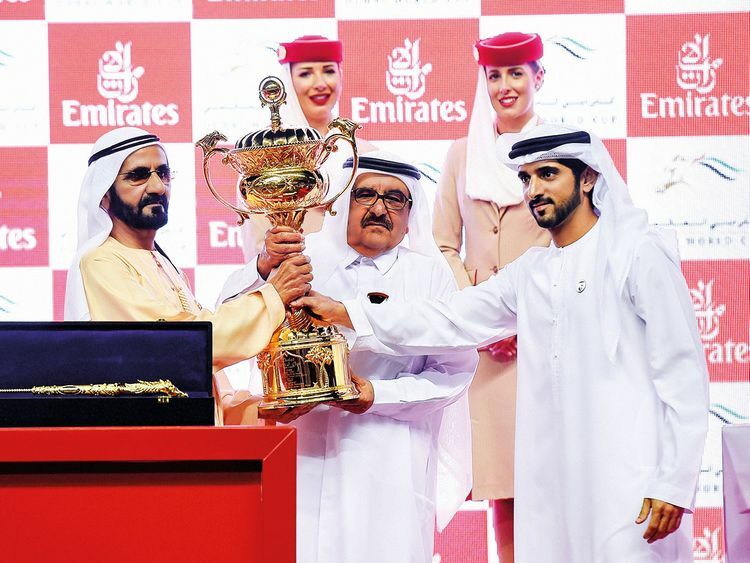 The race was reminiscent of the very first running of the Dubai World Cup in 1996, when the legendary Cigar and Soul of the Matter engaged in a titanic battle on the home straight, with the former prevailing by less than a length, as thousands of racegoers screamed themselves hoarse. This time, the margin was an excruciating nose between Thunder Snow and the runner-up Gronkowski. Despite being drawn on the dreaded outside, Thunder Snow broke smartly and was driven just off the early pace set by North America. Christophe Soumillon, arguably one of the best jockeys in Europe and a master of judging the pace, settled his horse into a smooth rhythm before the field entered the three-furlong home stretch. Gronkowski, making his first start for Emirati handler Salem Bin Ghadayer, had the first run under Oisin Murphy as Soumillon got to work on Thunder Snow. This horse is very brave always tries very hard. In France, he won two group 1 and also won brilliant races in Europe and America. He also came and won the World Cup twice now and also won UAE derby so surely the form of horse is good. 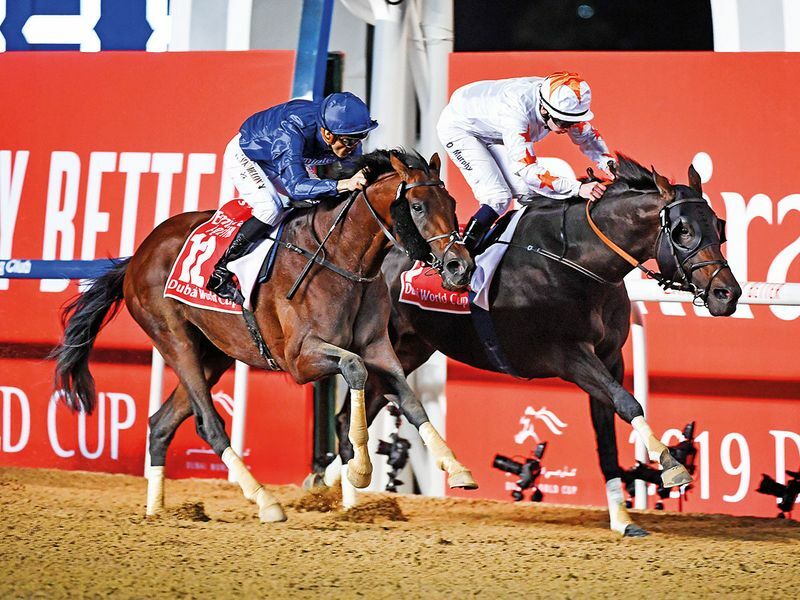 The pair raced stride for stride as a deafening roar hit the Meydan night sky and obliterated the pounding heartbeats of the over 60,000 crowd. As the pair flashed the post, almost as one horse, the racecourse erupted one final time and hailed a hero for the second time in as many years. American-trained Gunnevera ran on for third under Emisael Jaramillo with Pavel taking the fourth position for the second time in successive year for Joel Rosario. Two other heavly fancied local hopes, North America and Capezzano, finished seventh and last, respectively. Last year I won by five, six or more lengths and today I had to fight hard. Thunder Snow raced in the famous Royal Blue colours of Godolphin, the global racing stable created by His Highness Shaikh Mohammad Bin Rashid Al Maktoum, Vice President and Prime Minister of the UAE and Ruler of Dubai. Soumillon revelled in the moment and said: “Last year I won by five, six or more lengths and today I had to fight hard. The two horses in front were going a bit better than me but I gave him a chance. “I want to say a big thank you to Saeed Bin Surour and Shaikh Mohammad because just before the race, they said that I need to be confident and do everything right. Thanks to Thunder Snow as well for without him I wouldn’t be able to do such great things. Bin Surour, who was winning the race for the ninth time, commented: “This horse is very brave always tries very hard. In France, he won two group 1 and also won brilliant races in Europe and America. “He also came and won the World Cup twice now and also won UAE derby so surely the form of horse is good. “It is brilliant team work and Shaikh Mohammed had given instructions last year as well when we won and he was happy to see him win tonight again. We will take him to America and look at all the big races in Saratoga, wherever.